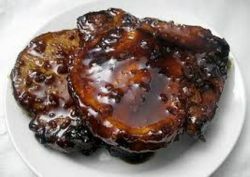 One food I always had trouble cooking was pork chops. They usually tasted good, but they never failed to be tougher than the soles of my shoes. After years of failed recipes, not to mention embarrassment, I finally took matters in hand and created this recipe. Like all the menus posted here, this has been prepared many times for tough critics and has always been well received. Give it a try and, please, let me know how your critics respond. Lay herbs into a glass dish large enough to hold the chops in one layer. Sprinkle garlic over the herbs. Carefully pour in about 1 cup olive oil into dish so as not to disturb the herbs. Grind pepper across the top. Lay the chops across the herb mixture. Add more olive oil until the chops are barely covered. Marinade in the refrigerator for 2-5 hours. Turn the cops once during that time. Remove dish from fridge 1 hour or a little less before cooking. The meat cooks better if it’s nearer room temperature. Preheat the oven to 250 F°. Add a little of the marinade to a medium size frying pan and heat on medium high until the oil shimmers. Add the chops and brown about 3-4 minutes on each side until golden brown. Transfer the meat to an ovenproof plate. Pour off all but a thin film of oil, add ½ cup of wine and bring to a boil. Return the chops to the pan. Cover and reduce the heat to a simmer. 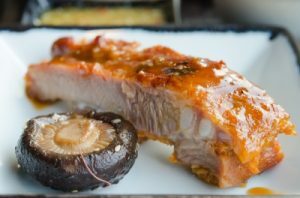 Cook for 30 minutes, basting with the pan juices occasionally, until they are tender when pierced with the tip of a sharp knife. Return the meat to the ovenproof plate, cover, and set in oven while you finish the potatoes and asparagus. Prepare the sauce just before serving dinner. Skim as much fat as you can from the braising liquid and pour in the remaining ¼ cup wine. Boil it over high heat, stirring and scraping in any browned bits that cling to the bottom and sides of the pan, until the liquid has reduced to a syrupy glaze. Off the heat, swirl in the butter and parsley, pour over the pork chops and serve. In a medium size saucepan add chicken stock and your preferred herb. Peel potatoes, rinse, slice in thirds, and then place into pot. Add tap water to cover the potatoes by about an inch or so. Too much water and the potatoes will be soggy. Not enough and they’ll be raw on the sections above the water. Cover the pot and heat on medium until the potatoes come to a boil. Adjust the heat and/or the lid to maintain a decent boil, but not a hard one, until potatoes are fork tender. It takes about 15 minutes after they begin to boil. Drain and return potatoes to pot. Discard bay leaf. Stir in butter and pepper before you serve. Add chicken stock and dry vermouth to a medium size saucepan. Insert vegetable steamer. Carefully add tap water to just below the bottom holes. Trim the stem end of the asparagus to fit your saucepan. Lay them in the pan and cover. Bring to a boil over medium heat, adjusting the heat to a strong simmer. In 4-5 minutes the asparagus should be crisp tender. 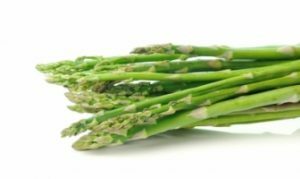 Lay asparagus in a serving bowl. Spread butter over them and serve. Thanksgiving in the USA is always celebrated the fourth Thursday in November. Every year we have at least twenty people for a sit-down dinner. I cook the meal and the guests supply the appetizers, deserts, and wine. It’s a wonderful time to reminisce, over-indulge, and have fun. Stuffing is definitely a winter food for us. I make a huge batch and freeze the unbaked extra in serving-size containers. Throughout the winter I’ll serve it with pork or chicken. Place unopened turkey on a cloth lined cookie sheet and thaw in refrigerator 7 hours per pound or one day for every four pounds of frozen turkey. If turkey’s not completely thawed, set in a large pot of cold water to complete. Dispose of packet inserted in cavity. Rinse well, then pat dry with paper towels. 10 – 18 lbs. 2 – 2½ hrs. 18 – 22 lbs. 2½ – 3 hrs. 22 – 24 lbs. 3 – 3½ hrs. Melt 1 stick of butter in a large frying pan. When the foam subsides, lay the turkey on its side breast down. Brown the breast until golden, first one side then the other. Be careful moving the turkey around, it’s heavy and awkward. Set disposable pan on cookie sheet. Insert cooking rack. Add chopped vegetables. Place turkey on rack breast up. Lay bacon slices over breast to cover well. Pour in enough chicken broth to cover the pan bottom by 1 inch. Cover the turkey and pan edges with aluminum foil, crimping the sides well. Remove from oven at the predetermined time. To test if the bird is done, use a paper towel or pot holder and shake hands with its leg. The leg should move freely. If you use a meat thermometer it should read 185° when inserted in the thigh. For an accurate reading, be sure not to touch bone. 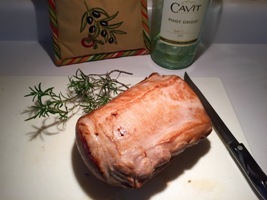 Tent with foil and allow to rest 30 – 45 minutes before carving. The stuffing may be prepared a day or two in advance up to the baking point. Fry sausage, breaking into small chunks until lightly brown. Melt butter in a medium size skillet. When the foam subsides add the celery and onion. Sauté 3-4 minutes, be careful not to let it brown. Empty bread cubes into a large bowl. Add sausage and vegetables with all their juices. Mix well. Beat egg in a small bowl. Pour onto stuffing. Sprinkle sage and thyme across the top. Mix well. Stir in chicken stock until mixture is very moist, but not soupy. 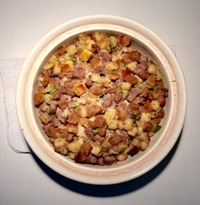 Remove stuffing from the refrigerator early in the day to allow it to come to room temperature. Bake the stuffing for a half hour. Remove foil and continue to bake until the top has browned. Pour one inch chicken stock into saucepan. Peel and quarter the potatoes, then place in saucepan. Add tap water to cover by one inch. Put a lid on the pan and bring to a boil over medium heat, then lower temperature to a strong simmer. Cook approximately 25 minutes. Test for doneness by poking a fork into a potato. It should insert easily. Drain potatoes. Mash well without adding other ingredients. Cool completely in a glass or ceramic bowl. Cover and refrigerate. Remove potatoes from the refrigerator early in the day to allow them to come to room temperature. When you are ready to serve, microwave potatoes until hot. Stir in butter, sour cream, milk, and pepper to the consistency you prefer. Drain the potatoes in a colander. Cut large pieces in half. Lay potatoes into a 13×9 inch glass baking dish. Sprinkle brown sugar across the top, then dot with butter. 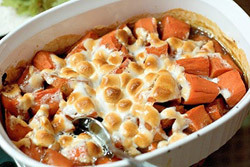 Scatter marshmallows over the yams and bake for 15 minutes or until the marshmallows are brown. Have all the ingredients prepped and on the counter before you begin cooking. In a medium skillet, heat oil over medium high heat until it begins to shimmer. Add onion, carrot and gingerroot. Sauté until carrot is almost soft. Test by inserting a toothpick into the carrot. Remove as many gingerroot pieces as you can find. Don’t worry if some are left in the pan. Add broccoli, red and yellow peppers, and garlic. Sprinkle on red pepper flakes. 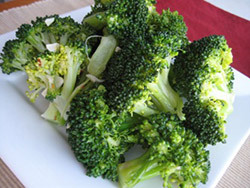 Stir constantly to insure broccoli is well coated with the oil. Add more oil if necessary. Squeeze on the lime or lemon juice. Sauté 2 – 4 minutes, but be sure the broccoli and peppers still have crunch to them. Blend in green onions and mushrooms. Sauté until mushrooms are heated through. Serve quickly. Serves 4 – 6 so adjust accordingly. Drain corn, then pour into micro wave safe bowl. Lay 2 or 3 pats of butter across the top. Micro wave for 3 minutes, stir and serve. Lay the sauce into a serving bowl, cover with plastic wrap and refrigerator until ready to serve. Pour the gravy into a saucepan. 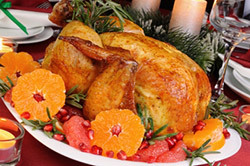 Stir in a few tablespoons of the juice from the roasted turkey pan. Heat through and serve. Once in a great while I’m compelled to cook a Sunday afternoon sit-down dinner like the one mom used to make. These aren’t her recipes, but they are close. I hope you enjoy them as much as we do. Pat the roast dry with paper towels. Melt lard in a Dutch oven over medium-high heat. Add pork and brown on all sides, about 20 minutes. Adjust the heat so as not to burn any part of the roast. Set the meat on a plate. Reduce heat to medium. Sauté onions until they are soft and translucent, about 5 minutes. Stir in garlic and cook for 1 minute. Add remaining ingredients to the pot and bring to a boil. Return the roast to the pot along with any accumulated juices on the plate. Cover tightly and braise in the center of the oven for 1½ hours or until a sharp knife inserts easily. Set the roast on a cutting board and tent with foil. Skim fat from the braising liquid. Strain the liquid and vegetables through a sieve, pressing down hard with the back of a spoon to extract as much juice as possible before discarding the pulp. Slice the pork into serving pieces and lay them on a platter. Moisten meat with a little of the sauce. Pour the remainder in a gravy boat and serve on the side. Pour one inch chicken stock into saucepan. Peel and quarter the potatoes, then place in saucepan. Add tap water to cover by one inch. Put a lid on the pan and bring to a boil over medium heat. Lower temperature to a strong simmer. Cook approximately 20 – 25 minutes. They are done when a fork inserts easily into a potato. Drain potatoes. Stir in butter, sour cream, and pepper. Mash well. Drizzle in the milk. Mash and continue to add milk until you achieve the consistency you prefer. Combine all ingredients except butter in a saucepan. Bring to a boil over medium heat. 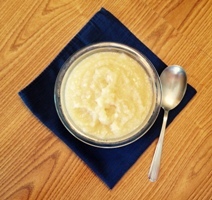 Reduce heat, cover pot, and simmer 15 – 20 minutes or until apples mash easily with a fork. Mash with a potato masher. For a smoother texture pour the sauce into a blender or food processor and puree for a minute or so. Turn into a serving bowl, cover, and refrigerate until ready to serve. This recipe also freezes well. Add chicken stock and dry vermouth or wine to a medium size saucepan. Insert vegetable steamer, then add water to just below the bottom holes. Snap off the ends of the asparagus and trim the spears to fit your saucepan. Add spears and cover. Bring to a boil over medium heat, adjusting the heat to a strong simmer. In 4-5 minutes the asparagus should be crisp tender. 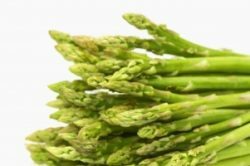 Lay asparagus in a serving bowl. Spread the butter over them and serve. I’m already looking for leftovers! Summertime is almost over, but we can still do some down-home cooking and enjoy the meal on the patio. So tie on your aprons and let’s get to it! Dissolve salt in a small amount of water. Add chicken pieces then cover with more water. Set this in the refrigerator for 4-8 hours. Remove chicken from fridge 2 hours before you plan to cook. When you’re ready, drain the chicken and pat dry. Combine flour and seasonings in a paper or plastic bag. Shake gently to combine ingredients. Mix egg and milk in a bowl. 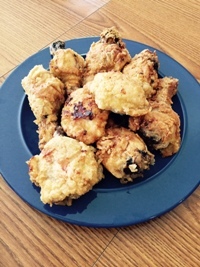 Set a clean plate or platter on the counter to hold the breaded chicken in one layer. Place one chicken piece at a time in the bag, shake gently to thoroughly coat, then dip in egg mixture, then return the piece to the bag and gently shake again. Set chicken on the plate. Repeat the process until all pieces are coated. Set the uncovered plate in the fridge for at least 30 minutes. Heat the shortening in a large frying pan over medium-high heat. Test to be sure shortening is hot enough by adding a small piece of bread. It should sizzle and toast quickly. Carefully add the chicken pieces. Maintain the temperature, but adjust it so chicken doesn’t burn and grease doesn’t splatter everywhere. Turning frequently, brown the chicken on all sides. Cover and cook 20-25 minutes or until juices run clear when pierced with a sharp knife. Lay pieces on a plate lined with paper towels to absorb any oil. Transfer them to a clean platter and serve. Pour one inch chicken stock into saucepan. Peel and quarter the potatoes, then place in saucepan. Add tap water to cover by one inch. Put a lid on the pan and bring to a boil over medium heat. Lower the temperature to a strong simmer. Cook approximately 20 – 25 minutes. They are done when a fork inserts easily into a potato. Bring large pot of water to a hard boil. A high heat setting is best. Drop the beans in by the handful. Boil 10 to 15 minutes or until the beans are just tender. 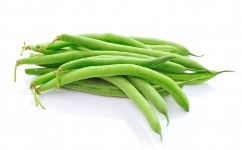 If you plan to reheat the beans, boil for less time as the reheating will cook them further. Drain beans in a colander. Add butter to the hot pot and swirl to melt. Return beans to the pot. Toss with butter and coat well. Season with pepper and stir again. The beans may be made earlier and reheated on low heat. Be careful not to scorch them or burn the butter. This meal screams for ice cold watermelon for dessert. Early in the day cut your melon into large chunks. This is a good time to get rid of the rind. 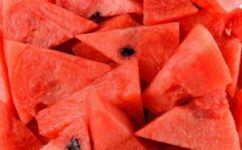 Place the melon into plastic bags, seal, and refrigerate until your dinner is settled. You may want to make one of those bags Adults Only by lacing a few shots of vodka over the melon. Very tasty! No one wants to heat up the house with cooking even if the air conditioning is at full blast. Here’s a menu geared for outdoor cooking. Hang onto it for those stormy fall and winter days because this meal also works great indoors. Keep the steaks to the side for a few minutes. Lay the dry ingredients in a glass or ceramic dish or a plastic bag just large enough to hold the meat comfortably. Sprinkle in the Worcestershire sauce and red wine. Gently stir. Add the meat. Pour oil along the side of the dish until it reaches half way up the steaks. Turn meat to coat top and bottom. 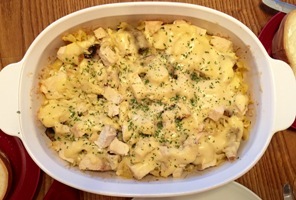 Set in the refrigerator for 2 – 4 hours. Remove the dish from the refrigerator 1 hour before cooking. Heat your outdoor grill to medium. Sprinkle a few drops of Worcestershire sauce on each side of the steak and spread out with your fingers. Grind fresh pepper on one side. Grill for 3 minutes each side for rare, 4 for medium rare, 5 for well done. Turn only once. Remove the steaks and tent with aluminum foil. Allow to sit on top of a warm stove for about five minutes. This will draw the juices back into the meat and will also cook the steak to perfection. If you use the oven broiler, follow the same cooking times. Wash the potatoes under cool running water. Dry thoroughly with paper towels. Rub the skins with a small amount of olive oil. Slit across the top large enough and deep enough to fit in a bay leaf. Roll in the salt and wrap in aluminum foil. Bake for about 45 minutes, depending on the size of the potato. Test for doneness by inserting a toothpick. If the potato is cooked enough the pick will slide in easily. When done, set the potatoes on a warm stove or inside a 200°F oven until ready to serve. Serve with butter, sour cream, and chives. Preheat on medium high. Prepare the potatoes in the same manner as above. Lay potatoes on bottom grate. Every 15 minutes roll the potatoes to a new side to prevent burning. It will take about 45 minutes to cook through. Test by inserting a toothpick. If the potato is cooked enough the pick will slide in easily. When done, set the potatoes on the upper rack until ready to serve. Remove egg from refrigerator while assembling all the ingredients on your counter. Bring a small saucepan of water to a boil. Coddle the egg by cooking it for 2 minutes. Rinse under cold water, crack shell and scoop the runny egg into a small bowl. Break up the solid white pieces and lightly mix. Later, you will add some of this to the salad dressing. In a large glass or wooden bowl, mash the garlic with a spoon and fork into coarse pieces. Rub the sides of the bowl with the oil that has been released. Add the anchovy, pepper, and mustard. Mix well. Pour in the lemon juice and vinegar. Mix well. Add in ½ – ¾ of the coddled egg. Mix well. Blend in the olive oil until the dressing is frothy. Tear the lettuce into bit-size pieces over the salad bowl. Toss, then add ¼ cup or so of Parmesan. Toss again. Serve in individual bowls and sprinkle with the remaining Parmesan. 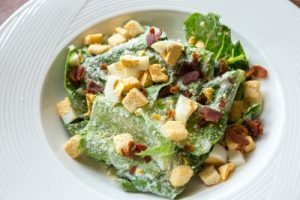 Add croutons and serve immediately. 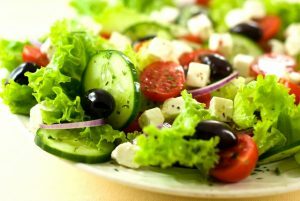 For a larger salad, adjust proportionally, but do not exceed two eggs. When my workload is heavy, I want a dinner that is easy and trouble free. This menu fills that criteria, but it tastes like I’ve slaved over the stove for hours. Place ribs in an ovenproof dish in a single layer bone side down. Pour in about a half inch of stock or slightly more. Cover tight with aluminum foil. Bake 45 minutes to 1 hour. The time depends on the thickness of the meat. Last 15 minutes, uncover the ribs and slather on the barbeque sauce. Continue to bake. 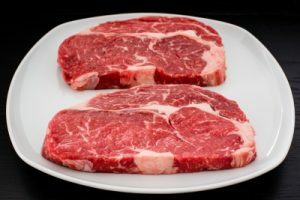 Do a visual check for doneness. You should not see any pink color close to the bone. 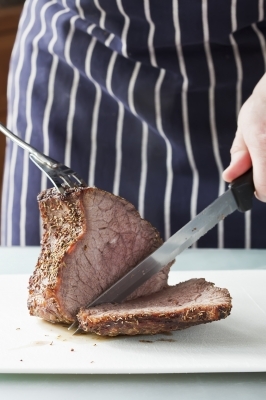 REMEMBER – meat continues to cook for a short time after it is removed from the oven. Serve with your favorite barbeque sauce. Add potatoes to a saucepan that holds them comfortable. Pour in stock halfway up the potatoes. Top off with water, covering potatoes by an inch or so. Add bay leaf. Set a lid on top. You can do up to this point earlier in the day. Leave on the counter or stovetop until you are ready to cook. Bring to a boil over medium heat. Adjust the lid and heat so the water continues a soft/light boil, but does not spill over. Cook for 15-20 minutes, then test for doneness. A fork will insert easily. Drain potatoes and discard bay leaf. Sprinkle pepper over potatoes. Add butter. Stir carefully so as not to damage potato shapes. 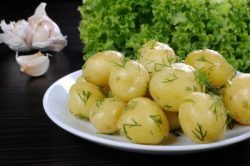 Lay potatoes in serving bowl and sprinkle with parsley or dill. Any and everything else in the fridge that appeals to you. Combine all the dry ingredients into a large bowl. Cover with a damp paper towel and store in the fridge until ready to serve. Your favorite bottled dressing or oil and vinegar work great with this hearty meal. Pour on a small amount of dressing and toss. Or, set a variety of bottled dressings on the table for everyone to help themselves. This dish may seem like a lot of work, but it really isn’t. Besides, you will love the beautiful blend of flavors. This recipe serves 2, maybe 3, people. Double it and freeze for a later meal. Combine chicken and all remaining ingredients in a 3-quart saucepan. Bring to a boil over high heat. Reduce temperature to low and simmer, partially covered for 15 to 25 minutes, or until the chicken is tender but not falling apart. Transfer the chicken to a cutting board. When cool enough to handle cut the chicken into 1-inch pieces. Set aside. Strain the cooking liquid through a fine sieve set over a bowl. Press down hard on the vegetables with the back of a spoon, then discard them. Skim and discard the greases that rises to the top. Reserve the stock to use later in this recipe. Bring 3 quarts of water to a boil in a 4-quart saucepan. Drop in noodles and boil for about 9 minutes or until just barely tender. Be careful not to overcook them. Drain the noodles in a colander and rinse under cold water. Set aside. Melt butter in a small skillet set on moderate heat. 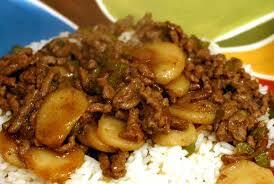 Stir in mushrooms and cook for about 5 minutes, or until barely tender. Set aside off the heat. Melt butter in a 2-quart saucepan set on moderate heat. Whisk in the flour and mix thoroughly. Gradually add 2 cups of reserved stock, cream, and sherry. Cook over high heat until this blend comes to a boil. Reduce heat to moderate. Whisk the yolks in a small bowl. Slowly add about ½ cup of the hot liquid while whisking constantly. Now stir this egg mixture into the saucepan. Cook for 1 or 2 minutes, then stir in hot sauce. Remove pan from heat. Coat the bottom and sides of a 8-by-10-by-2-inch baking dish, or a dish as close as you can get, with the butter. Pour in 1 cup of sauce and scatter half the noodles over the bottom. Spread on half the mushrooms, then cover with half the chicken. Repeat the layers and top with remaining sauce. Sprinkle cheese over the dish. This recipe freezes beautifully. Thaw and add a little cream to the leftover. Bake for 15-25 minutes at 325°F. Nothing gripes me more than to see chop suey meat in the grocery store hovering close to $4.00 a pound on a good day. These fatty chunks are scraps the butcher carved off who knows what, or when, and lumped into a package for us consumers to blithely purchase. Over the years, I have learned it is best, and cheaper, to buy small roasts on sale, and cut them myself. At least I know what meat I’m actually getting. Many grocery stores sell egg rolls in the deli. If you go this route, reheat them at 350F for 15 – 20 minutes. The other day my store was out of them so I used Tai Pei Mini Vegetable Spring Rolls, found in the freezer section. The bag holds 15 rolls and 2 sauce packets. No MSG is added and they have zero trans fat. They bake up crisp in 12 minutes at 450F. The taste and texture were wonderful! Serve the egg rolls as an appetizer just before the rest of your meal is done cooking. Cut the meats into 2 inch cubes. Over medium-high heat, combine the oil and butter in a large pot. When the foam subsides, brown the meat in batches. Be sure not to overcrowd the pot. When the batch is browned, remove to a bowl and continue until the meat is complete. Stir in celery and onions, sauté until soft. Return meat to the pot. Blend beef stock and corn starch in a small bowl, then stir into pot. Add bead molasses and soya sauce. Stir well. Mix in bean sprouts, water chestnuts, crushed red pepper, and garlic. Cover pot and simmer 1 hour. This dish freezes well for future meals. Prepare rice following the package directions, but exchange ½ the water with chicken stock. Pasticcio is one of our favorite dishes to prepare and eat. This recipe easily serves 4. If only two are enjoying this delicious meal, don’t worry about leftovers. They are amazing reheated in the microwave or oven. Heat the oil in a large frying pan. Sauté the red pepper and onion until soft, but do not let them brown. Stir in the garlic and cook for 45 seconds. Add the meat and cook, stirring often, until browned. Mix in the tomatoes and wine. Bring to a boil, then simmer for 20 minutes or until thickened. Stir in the parsley, anchovy, and black pepper. The sauce can be prepared early in the day, then held to the side until you’re ready to assemble the pasticcio. If the wait is longer than a few hours be sure to refrigerate the sauce to preserve it. Bring a medium size saucepan to a hard boil. Add the pasta and cook for 10 minutes or until almost tender. Start timing when the water returns to a boil. Drain and transfer to a bowl. Stir in the cream. Use a wooden spoon to beat the yogurt, eggs, and nutmeg together in a medium size mixing bowl. Brush an ovenproof dish with olive oil. Spoon in half the pasta and cover it with half the meat sauce. Repeat with remaining pasta and sauce. Spread on the topping and sprinkle with cheese. Bake for 25 minutes or until golden. 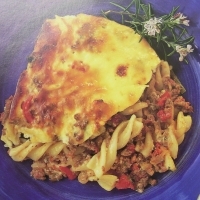 To serve: Cut the pasticcio into medium size portions, but only enough for the present meal. Use a spatula to lay the slice onto a dinner plate. This month is dedicated to comfort food, specifically Southern comfort food. Our meal is tasty and easy because it’s a one pot event. Pour the stock in a 5 quart saucepan. 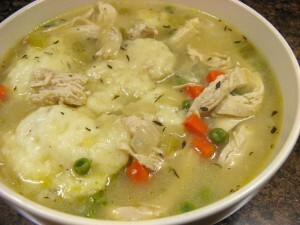 You need that size so the dumplings cook properly and you have leftovers to freeze. Add the carrots and pepper. Bring to a boil. Lower the heat and simmer for 20 minutes. Tear the meat into bite size pieces. Add to the pan. Combine water and cornstarch, then stir into the saucepan. *Kitchen Basics is made by McCormick. KB stocks are made from real chicken or beef which makes your dish more savory. And most important – they are not “flavored” as are so many other brands. KB stocks also tend to be the lowest priced on the shelf. **It’s no problem if you don’t have cooked chicken on hand. Simply place your fresh or thawed chicken pieces in the same pot you’ll use for the meal with 1 quart water. Bring to a boil then lower the heat and simmer for 45 minutes. Remove the chicken and let cool before you tear it. Pour the cooking water into a bowl to cool. 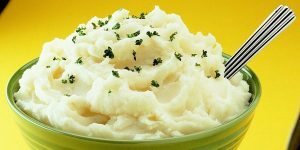 Skim off as much fat as possible then pour into containers and freeze for future use when you boil potatoes or heat vegetables. Combine Bisquick® and milk in a bowl. Mix until a soft dough forms. Return chicken and stock to a boil. Drop the dough by large spoonfuls onto the stock. Reduce heat to simmer. Cook uncovered for 10 minutes. Cover the stock and cook another 10 minutes. To serve: Ladle into large soup bowls then sprinkle with dried parsley for color. Leftovers freeze beautifully for up to 2 months. Combine everything, or any grouping you like, in a bowl. Cover with a damp paper towel and store in the fridge until ready to serve. Toss with your favorite dressing. Celebrate Valentine’s Day with a romantic dinner that gives you delicious leftovers. Don’t worry about alcohol content. It cooks away, leaving behind a rich taste to enhance the meat. Mix the garlic, oregano, pepper, and bacon together. Make deep incisions in the beef and insert the bacon blend. In a heavy 10-12 inch skillet melt 1 tbsp. butter with the olive oil over moderate heat and brown the beef on all sides. Melt the remaining butter over moderate heat in a Dutch oven. Combine the onions, carrots, and celery on a cutting board and chop them together until fine. Add this mixture into the butter in the Dutch oven. Stir frequently for 10 minutes or until the veggies are soft and lightly colored. Place the browned beef on top. Discard most of the fat from the skillet, pour in the wine and boil it briskly over high heat, stirring and scraping in the browned fragments. When the wine’s reduced to about ¼ cup, add it to the Dutch oven with the beef stock, chopped tomatoes, and bay leaf. The liquid should come about a third of the way up the side of the beef. Add more stock if necessary. Bring it to a boil over high heat, cover tightly, and braise in the middle of the oven for 2 hours or until tender when pierced with the tip of a sharp knife. Next, and this is really important, pour yourself a glass of the red wine, grab a good book, and read for the duration of the cooking time. To serve, transfer the meat to a cutting board, tent with foil, and let rest for at least 10 minutes but no longer than 15 minutes. This allows all the natural juices to stay within the meat when you cut it. Strain the sauce through a fine sieve into a serving bowl, pressing hard on the vegetables to extract all their juice. Skim off as much fat as possible. Reheat as necessary. Slice the meat and arrange so the slices are overlapping. Moisten the slices with a little of the sauce and enjoy. Your stove and countertop will be a mess from boiling down the wine. No problem! Grab the glass cleaner. A few sprays and it wipes right up. Don’t worry about the quantity if you and your favorite partner are the only ones at the dinner table. Slice off just the amount of roast you think you’ll eat, and freeze the rest. It’s great for those days when you’re too busy to bother with more work. Bring a small saucepan of water to a boil. Carefully place the egg in the pan and coddle it for 2 minutes. Rinse under cold water, crack shell and scoop the runny egg into a small bowl. Break up the solid white pieces and lightly mix. Later, you will add some of this to the salad dressing. 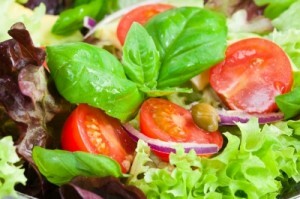 Tear the lettuce into bit-size pieces over the salad bowl. Toss, then add ¼ cup or so of Parmesan. Toss again. Serve in individual chilled bowls or plates and sprinkled with the remaining Parmesan. Serve immediately. If you choose to use croutons I suggest you buy them. I’ve not been able to create good croutons.